I can’t tell you enough how much I enjoy preparing each and every “Beautiful Homes of Instagram” post for you every week. This series give all of us the ability to find accessible inspiration and see how we can improve our interiors in a more realistic way. 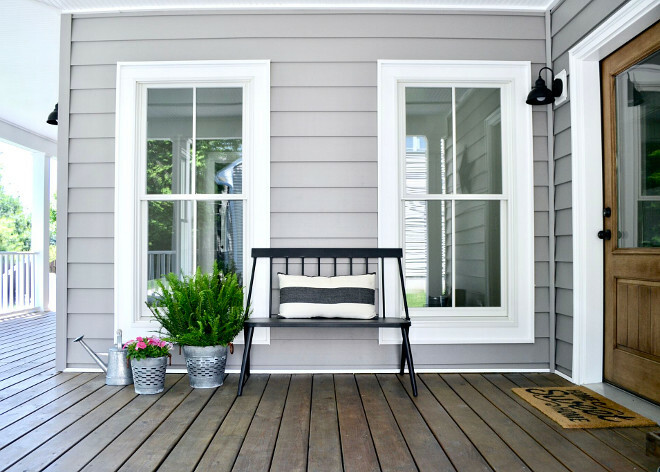 These homeowners open the door to their home, take the pictures and share not only all of the sources for paint colors​, lighting, flooring but they also share their story. Today you will meet Michele from @sweetthreadsco. Here, she will tell you what made her and her husband want to build their home and she will tell you how handy her husband is. I think you guys will love getting to know this beautiful family and their home! Hi all! My name is Michele, stay at home mom to 3 sweet kids and wife to my high school sweetheart. 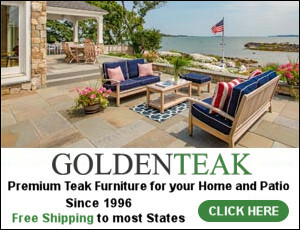 I was just honored when Luciane asked to feature our home and am thrilled to share it with you all. The home process was not an easy one for our family. After searching for almost 3 years and losing countless offers, a piece of land fell into our hands in the small suburb outside of Philadelphia we now call home. Building was never in our thoughts as we had been looking at mostly older homes and fixer uppers. 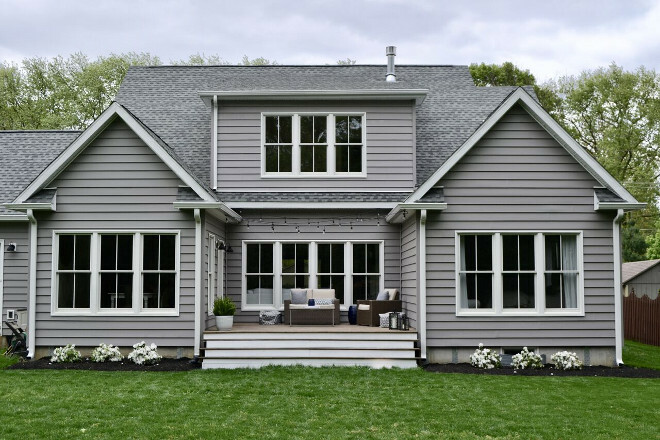 After realizing the time and money we would spend on fixing up those homes, we chose to build a custom home that would meet all our family needs. 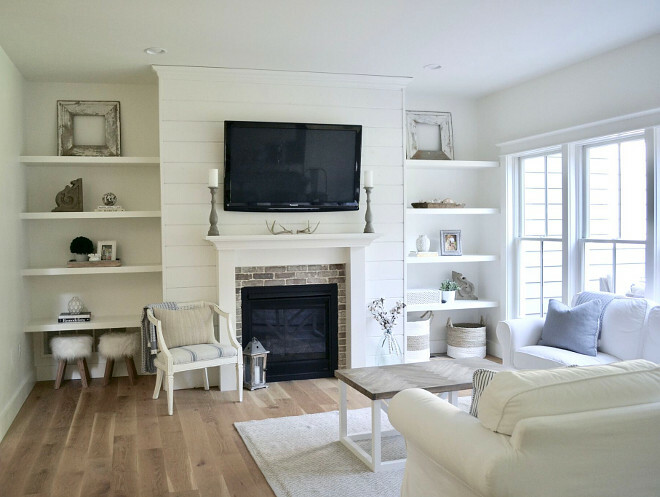 We knew immediately we wanted a farmhouse style and after looking at hundreds of house plans, we fell in love with the Stone Creek plan by Southern Living. 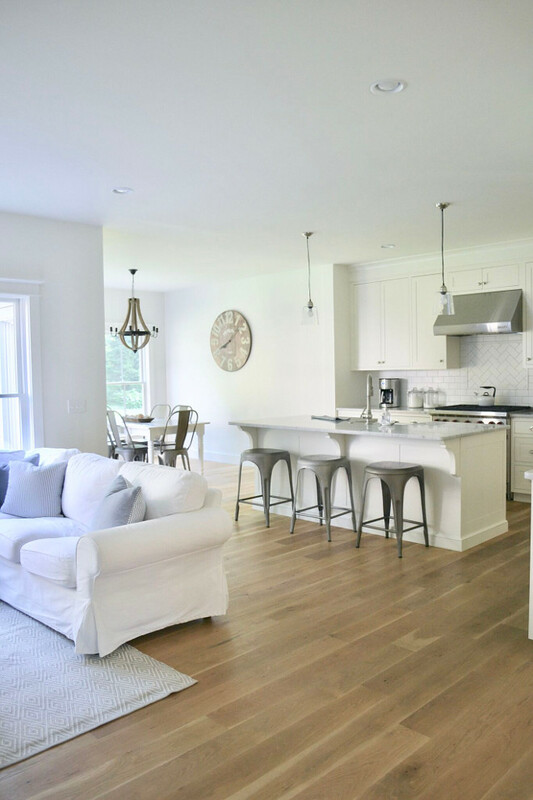 We loved its open floor plan and were able to tweak the home and make some changes, one of the biggest changes was removing the garage. We hope to build a detached garage in the future. 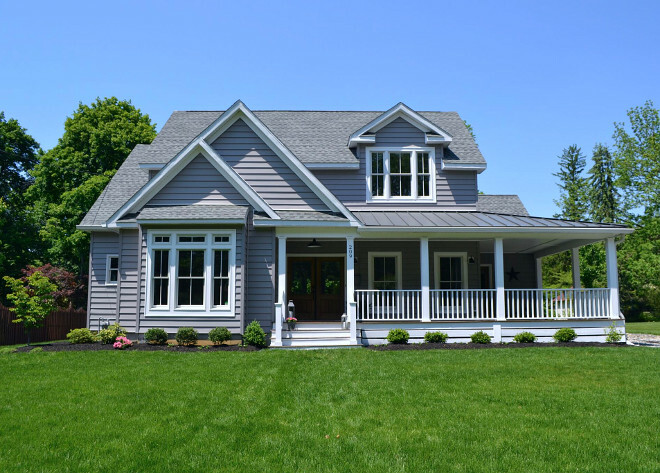 Our home now sits at a little over 3,000 square feet with 4 bedrooms, 3 ½ baths and an unfinished basement. I can honestly say I made every design decision for our home. 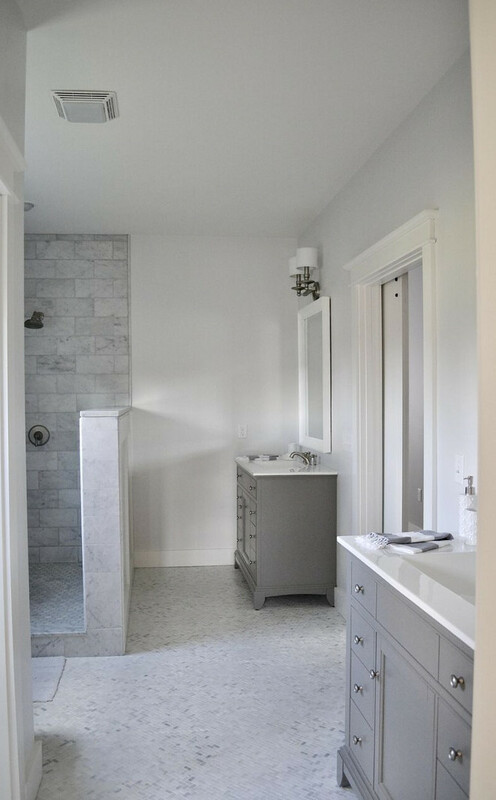 From the flooring to the cabinetry, to the hardware and trim work, every detail of our home was a made by us. It was certainly an overwhelming process and I turned to Pinterest and Instagram for inspiration. 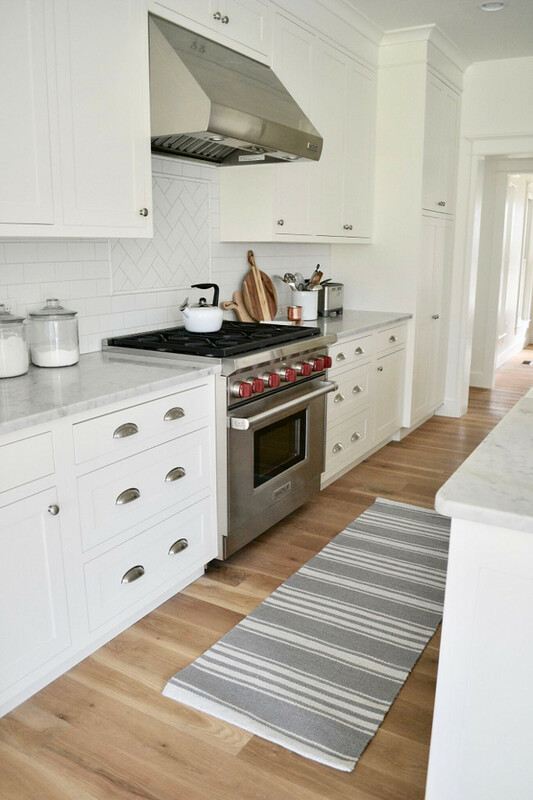 I did know I wanted to stick with a classic and timeless style throughout the whole house and I wanted to keep everything light, bright and neutral. 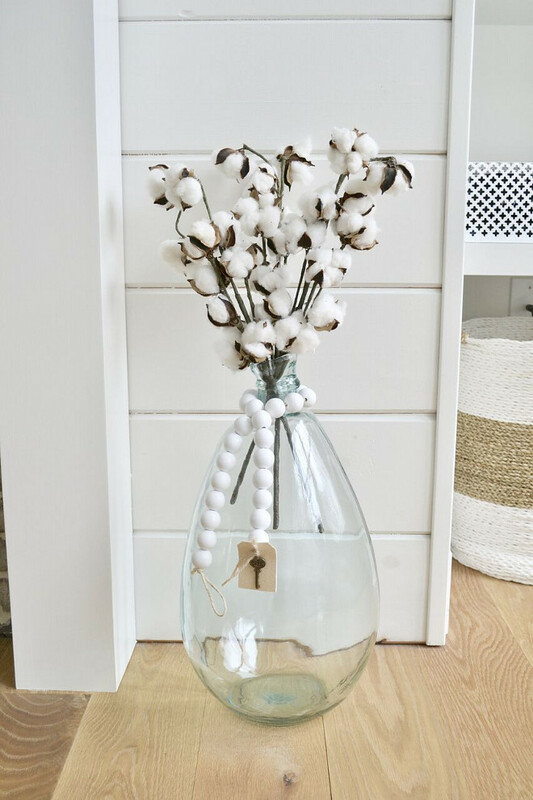 My home décor style is very simple and I love mixing in old and new pieces. The most interesting part of our build process will come as a shock to many, but we did all the interior work and finishings ourselves. Well I should say, my husband did! He truly is the Chip to my inner Joanna. He installed all our hardwood floors, tiled all the bathrooms, built the back deck and finished off the front porch. 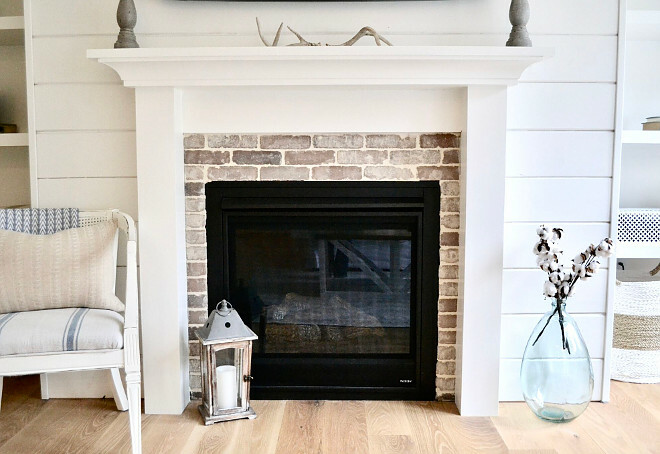 He did all our kitchen backsplash, built our fireplace surround and mantle and his biggest project was our brick paved mudroom floor. All in all, this home was a family effort, one of our biggest projects ever, we are honestly still doing work, but it’s a home we are so proud of and that we enjoy every second of being in! 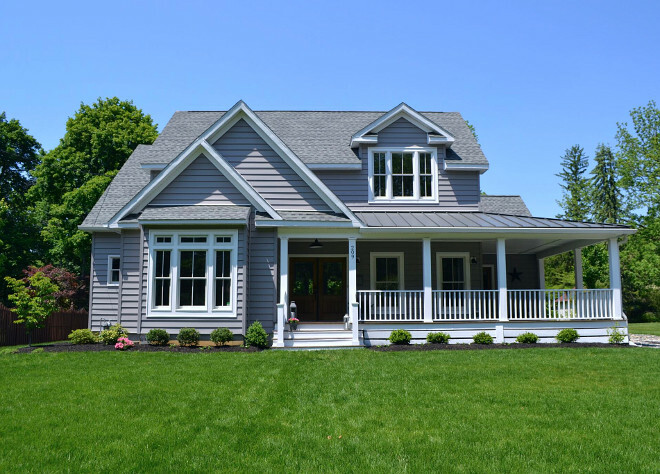 We loved the plan of the Stone Creek model mostly for its large covered porch. It is almost 400 square feet and features 2 entry doors. 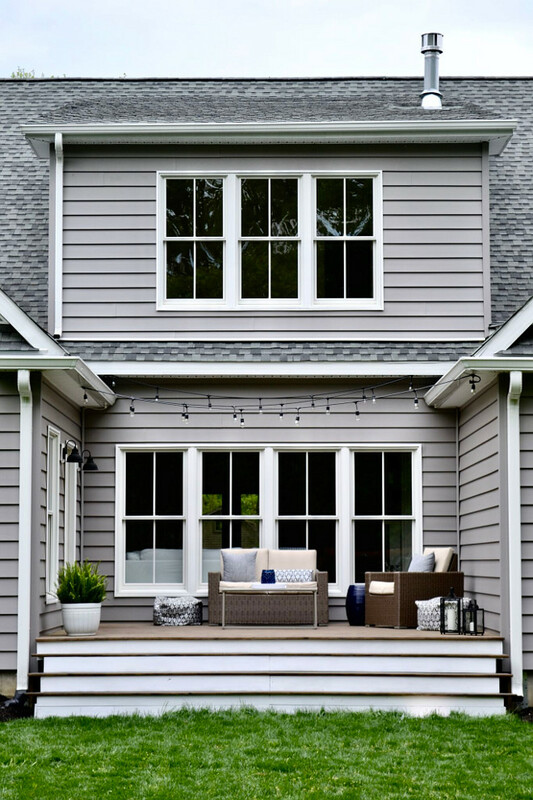 Exterior: CertainTeed 7” Cedar Boards in Granite Gray. 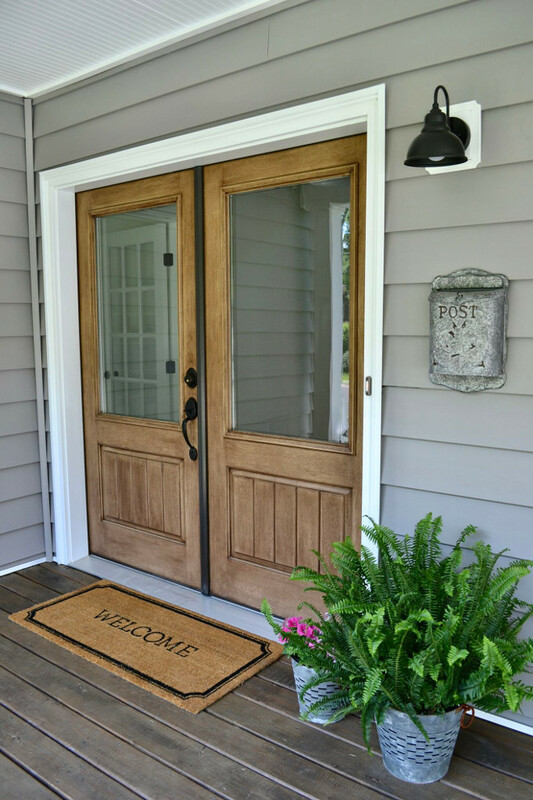 One of my favorite features of our entry is our double doors. 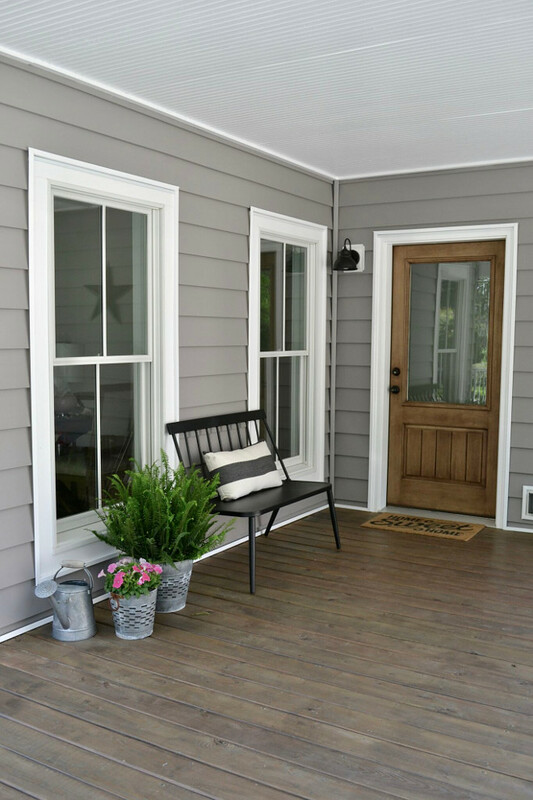 The wood tones add warmth and character to our porch and we chose the clear glass panes to add extra light to our home. 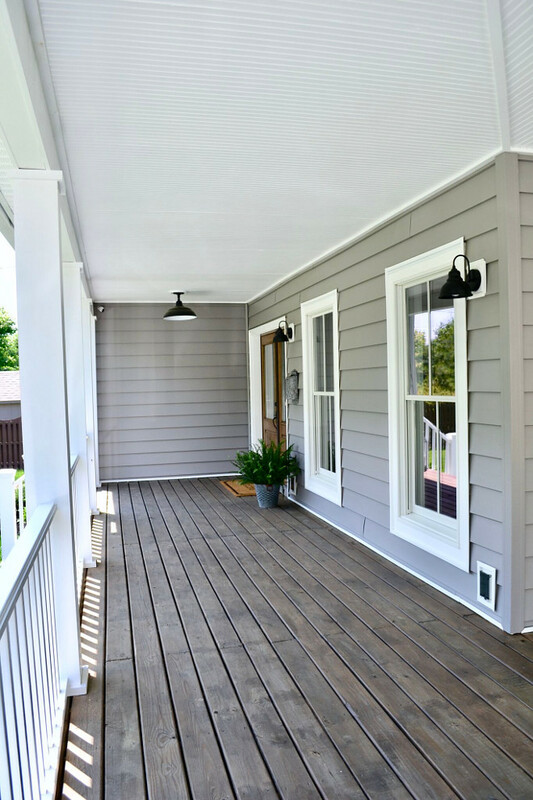 The front porch wraps around to the side entry which leads into our mudroom and kitchen area. 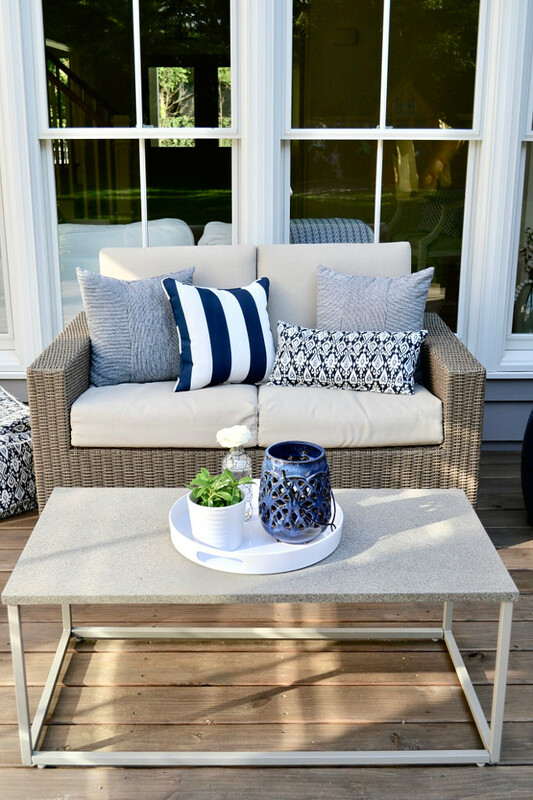 The bench was a fun find from Target this year and adds some charm and seating to our front porch. 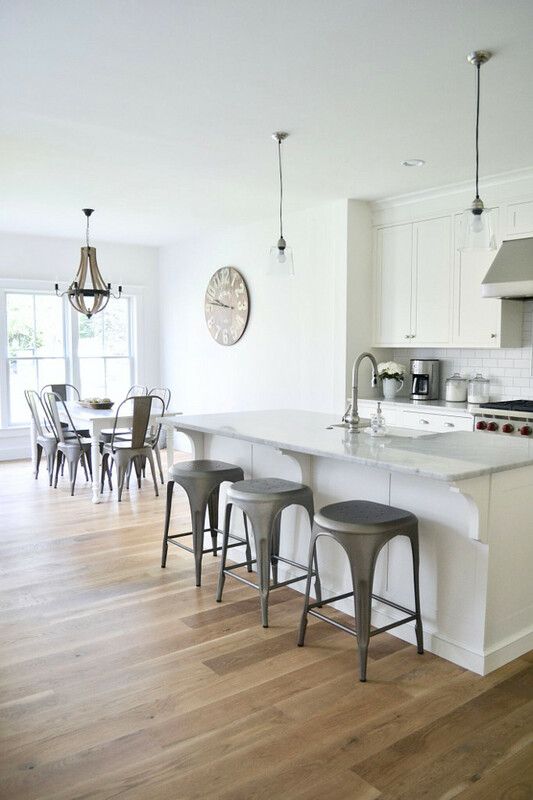 The one thing we loved about this home was the open floor plan of the first floor. The family room, kitchen and breakfast nook are the main living spaces in our home and the places you will find us the most. 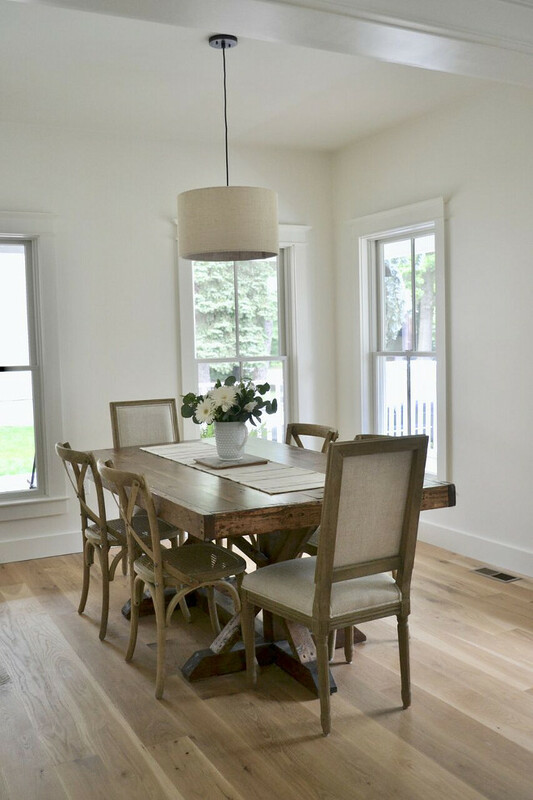 Our home has lots of windows so even on a gloomy day it is still light and bright which was another reason we chose this floor plan. 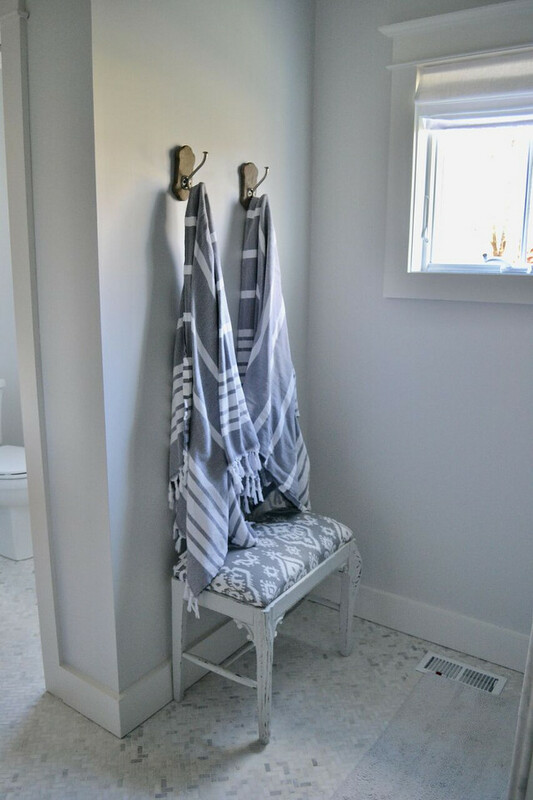 Even though everything is white and light, we chose more a rustic tone for our flooring to break it all up and I have added some pieces of décor in wood tones to balance out the space. 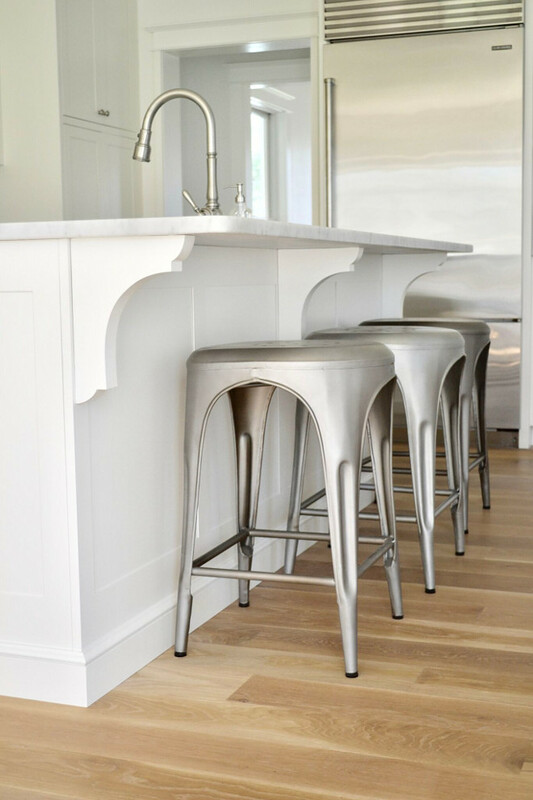 Flooring: 7” White Oak with Woca White Oil Finish. 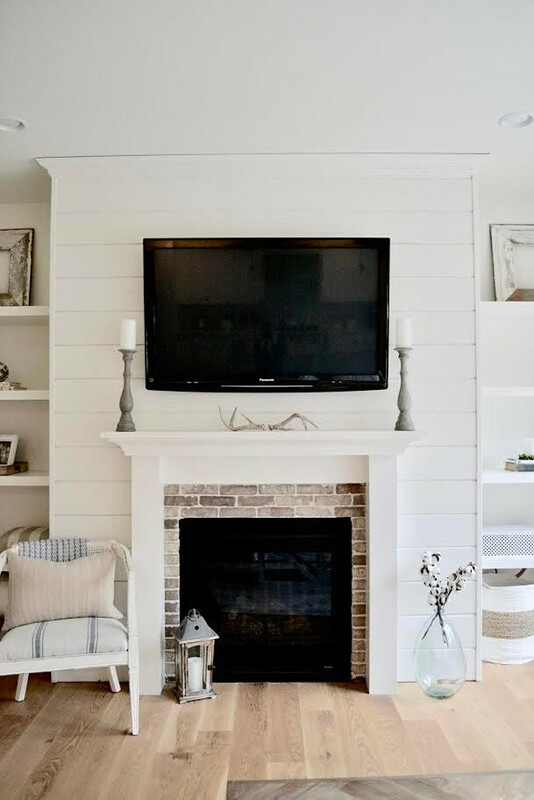 The shiplap fireplace is one of my favorite features of the room and gives the room some added character. My husband built the fireplace surround and mantle and all the built ins. 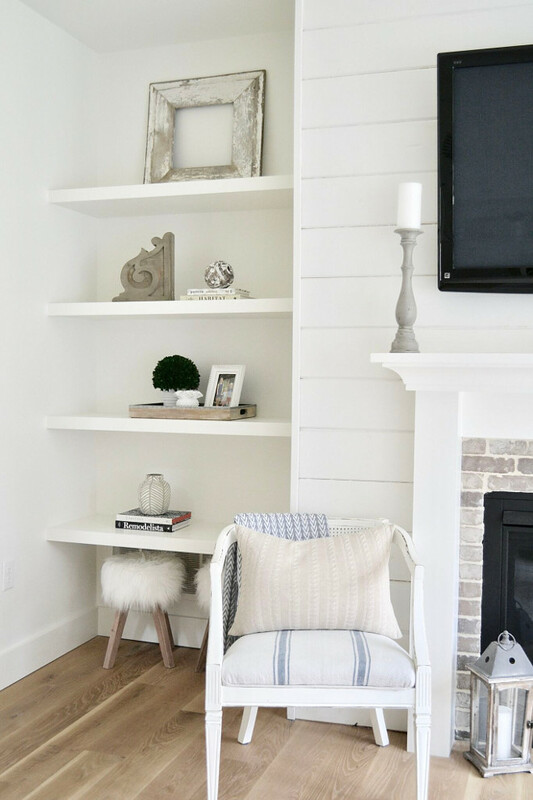 The built ins are a mix of new and old finds from some of my favorite stores or flea markets. I have loved filling them with treasures than with meaningless pieces. They will be full one day but for now I am enjoying the clean, simple style. Yes I am crazy! 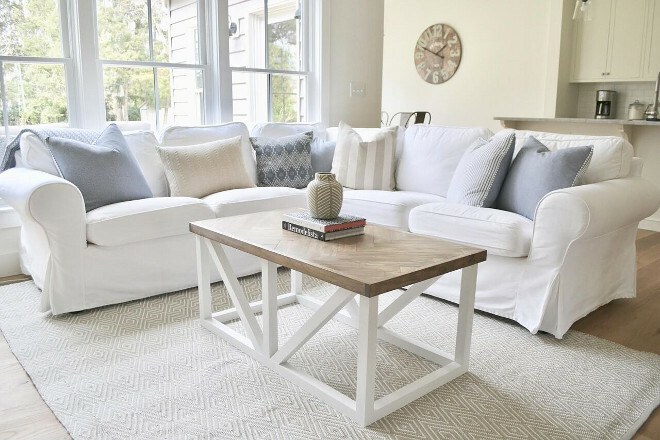 I have 3 young kids and a white couch but it is a slipcover and machine washable. Any stain or spill always comes out and I couldn’t imagine having any other couch or color in here. We love having the sectional in here and enjoy having family movie nights every Saturday. 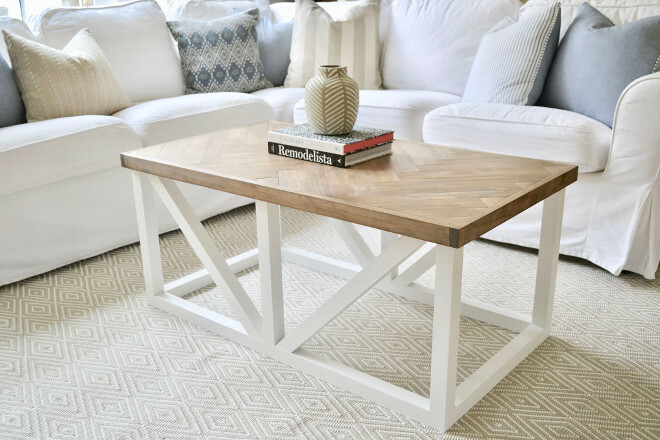 My favorite furniture piece in this space is our coffee table. It was a labor of love built by my husband. The herringbone top took a few weekends to complete and it is a piece we will all treasure forever. 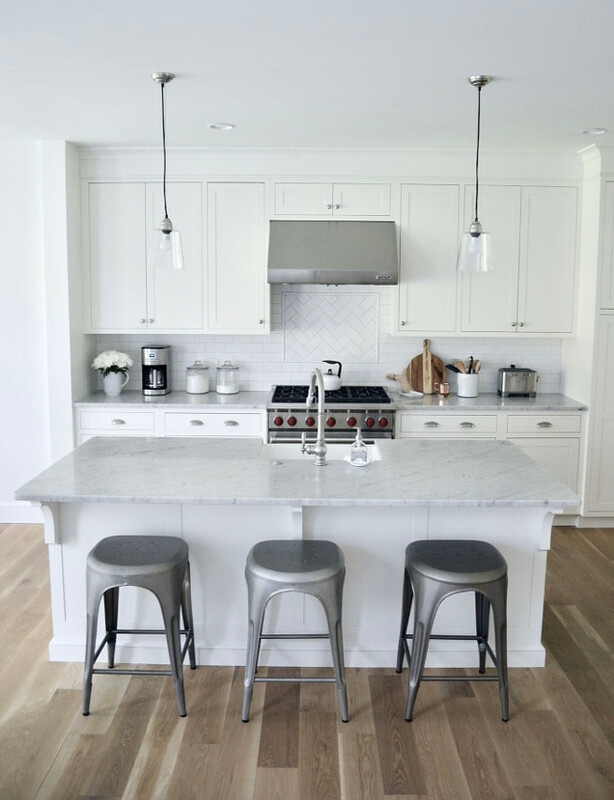 The heart of any home is the kitchen and it certainly is in ours. Family dinners, homework, game night it’s all done here. 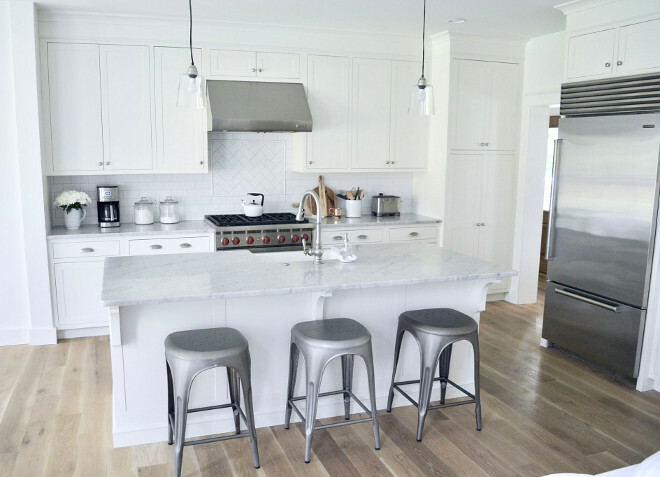 The space is very open and I can cook while the kids watch TV or do homework and we love the large center island. 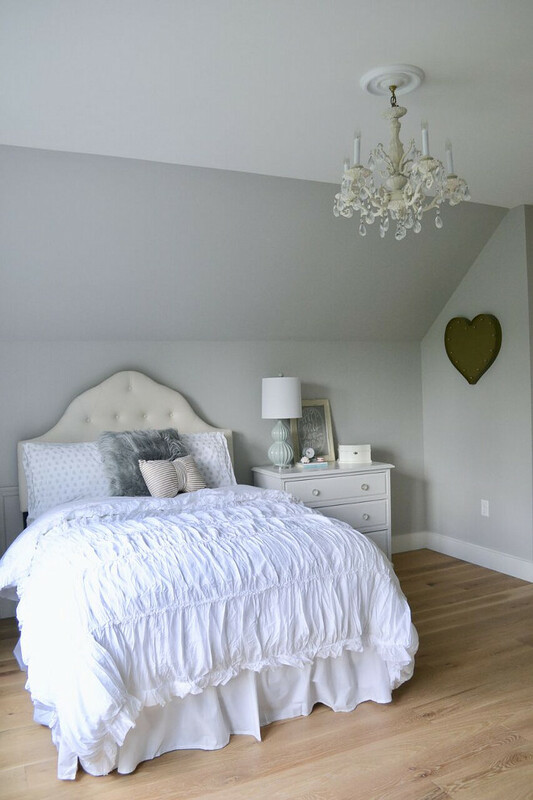 Paint Colors: Entire home but bedrooms are painted in Alabaster by Sherwin Williams, that includes the ceilings, walls and trim all in different sheens. 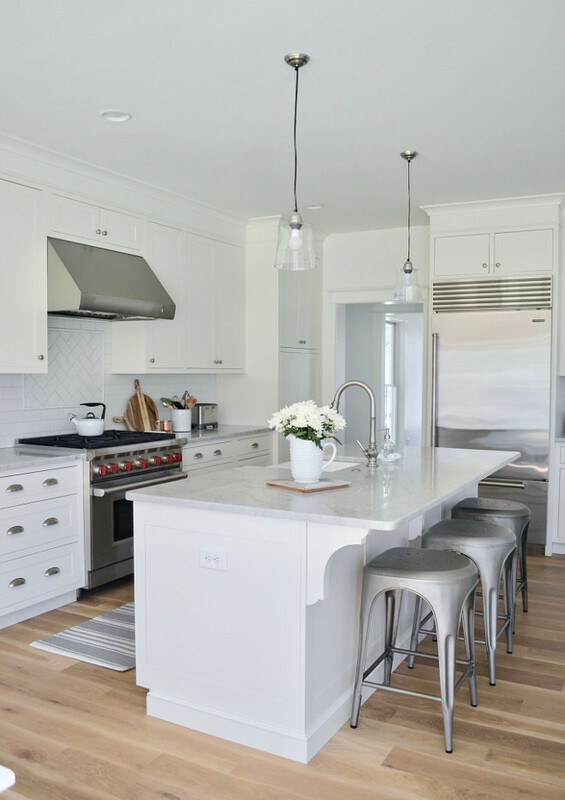 Cabinets: Tedd Wood Custom Cabinets painted in Alabaster by Sherwin Williams. The kitchen runner is Williams Sonoma. 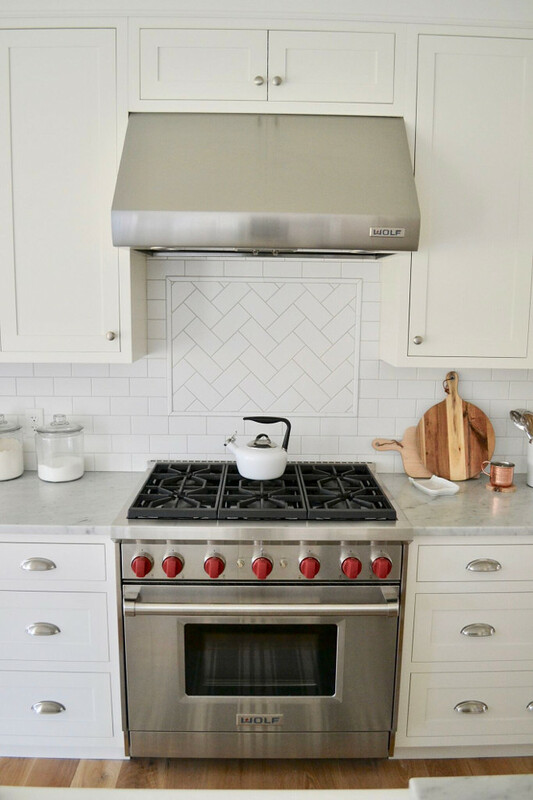 Backsplash is White Subway Tile in Matte Finish. 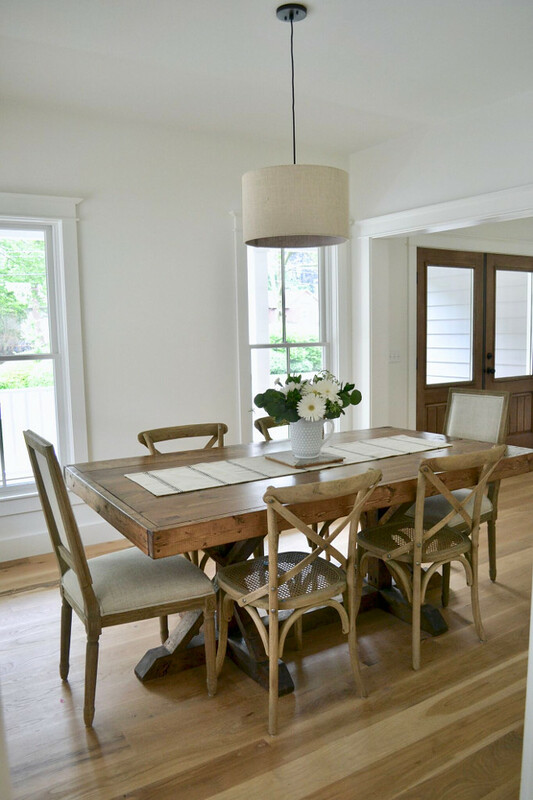 Right off the kitchen is our breakfast nook with a large farmhouse table built by my husband. This is where we eat dinner every night and the kids color or do homework. 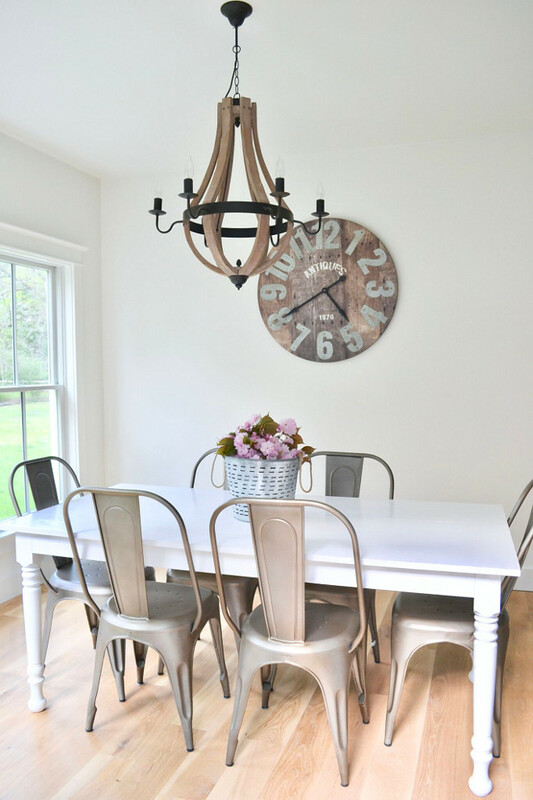 To tone down all the white in this area, I added the large wall clock and one of my favorite wood chandeliers. 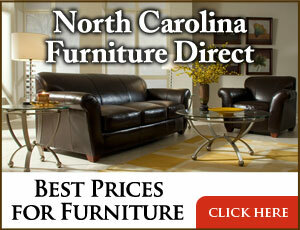 The wood tones really warm up the room and give it a more rustic feel. Our dining room unfortunately doesn’t get used much, only for the holidays but it is one of the first room you see when entering the main doors of our home so we try to keep it looking presentable. My handy hubby built the dining room table in here as well and it is definitely another piece we will treasure for years to come. Also right off the entryway is our current playroom since our basement is still unfinished. For now, having this room here is easy since the kids are still little. 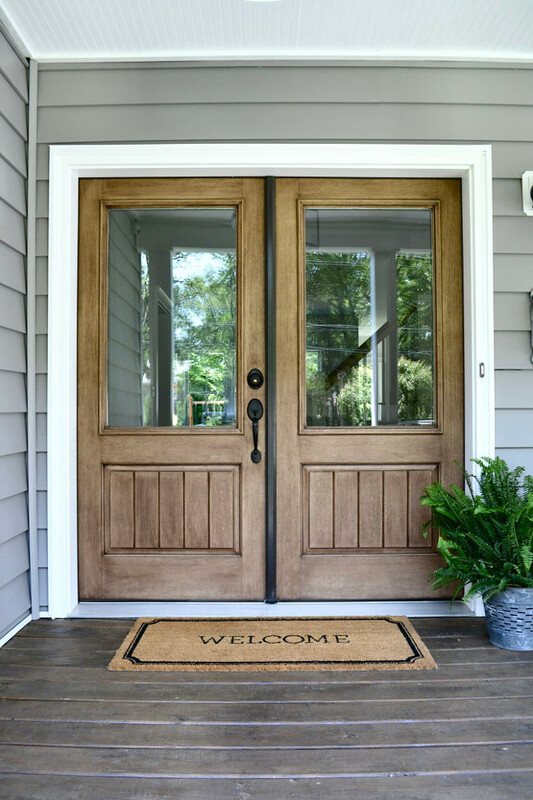 There is a half French door so the room doesn’t feel so closed off yet we can still close it when needed. The room features a vaulted ceiling and 3 large windows. One day we hope to utilize this space as another family room or living room. 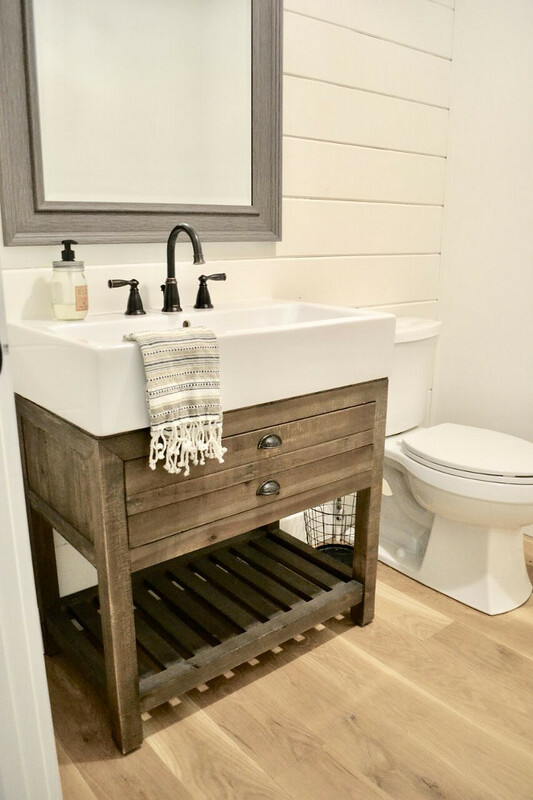 Our guest bathroom on the main level is definitely has some rustic, farmhouse charm with a shiplap wall and wood trough sink. 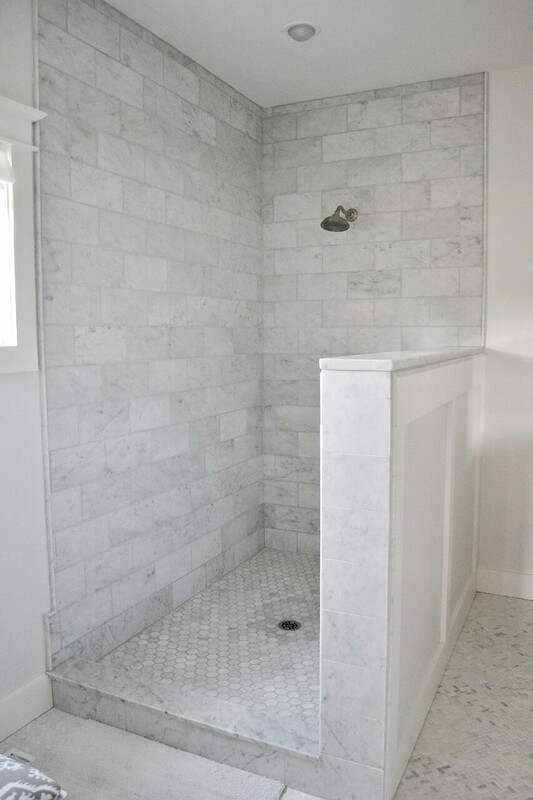 Our master bathroom features all Carrara marble tile in different patterns to add some interest and dimension. 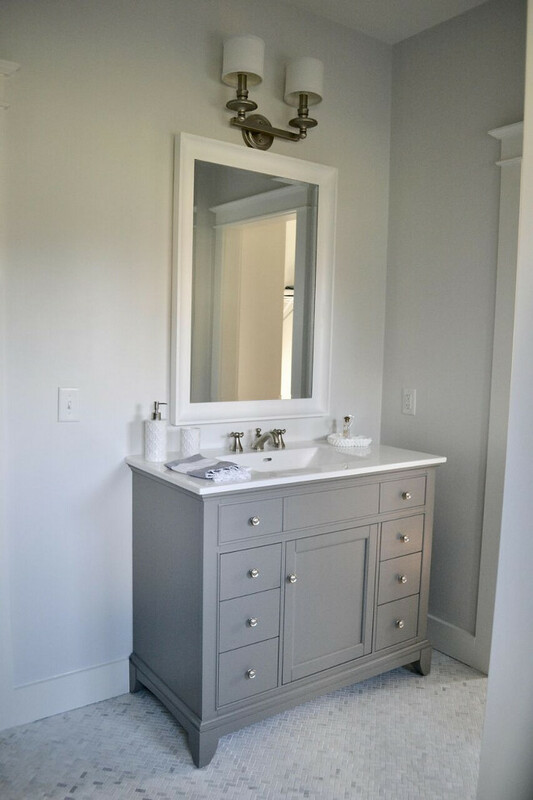 The walls are painted a very soft gray and we chose dark gray vanities to give the bathroom a more modern feel. 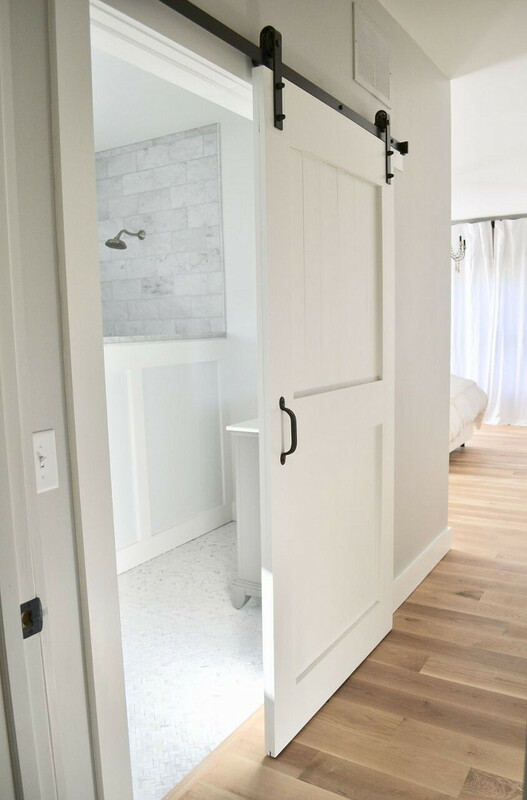 My husband built a barn door to add more privacy to the space. The second floor of our home is where all 3 kids rooms are and 2 full baths. 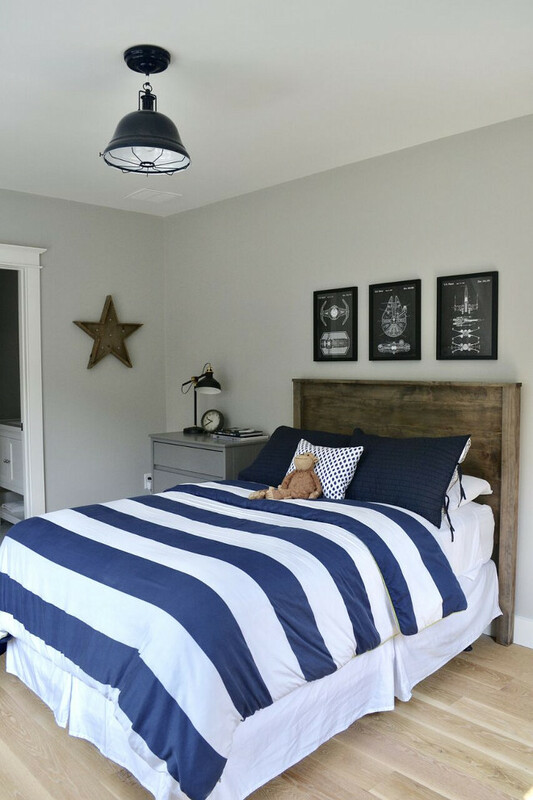 We loved this floor plan because the kids really have their own space. My son’s room is at one end of the hallway and features a full bath. The dressers were my grandparents and have recently been repainted and the headboard was another DIY project. 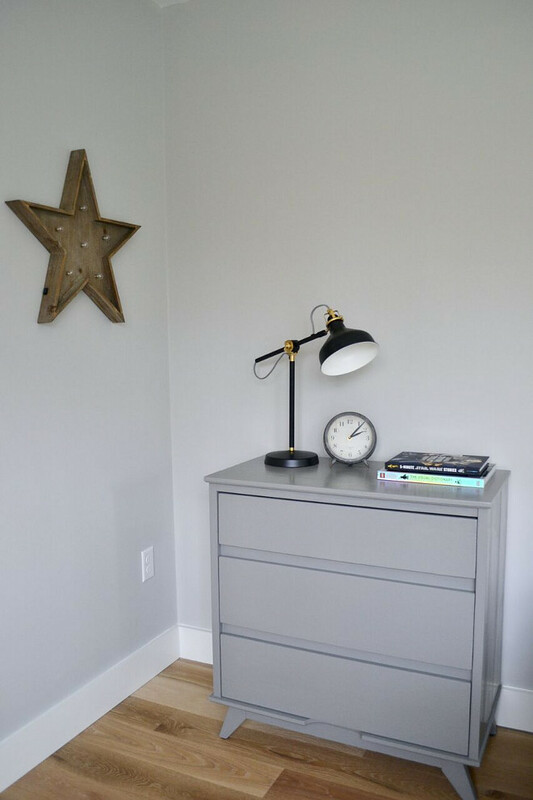 Dresser: Painted in Chelsea Gray by Benjamin Moore. 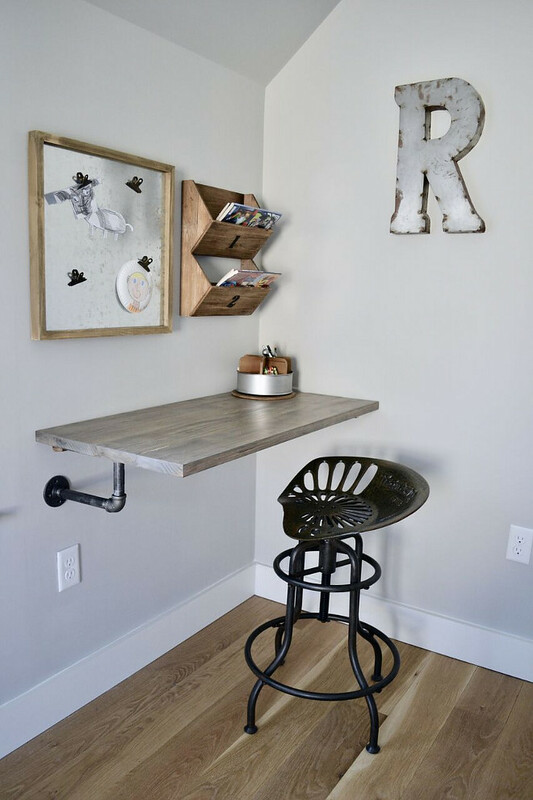 One of the most unique features in his room is the floating industrial style desk my husband built for him. 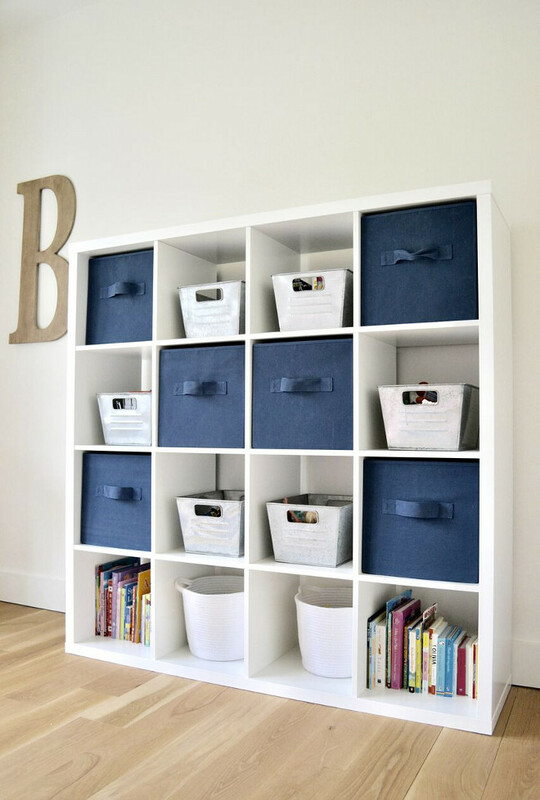 It has been one of my most favorite DIY projects to date. At the other end of the hallway are the 2 girls rooms and a full bathroom they share. My oldest daughter’s room is fit for a 10 year who is over pink but still a princess. 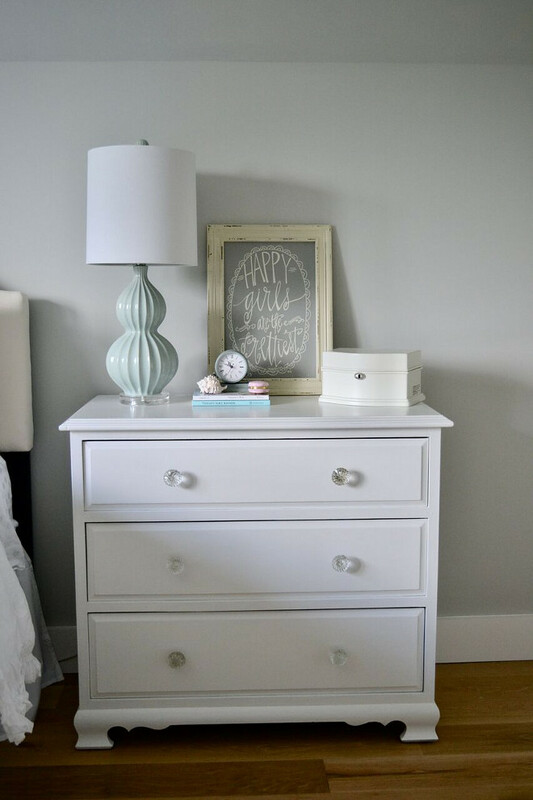 The nightstand and armoire were mine from when I was a child and were recently repainted. 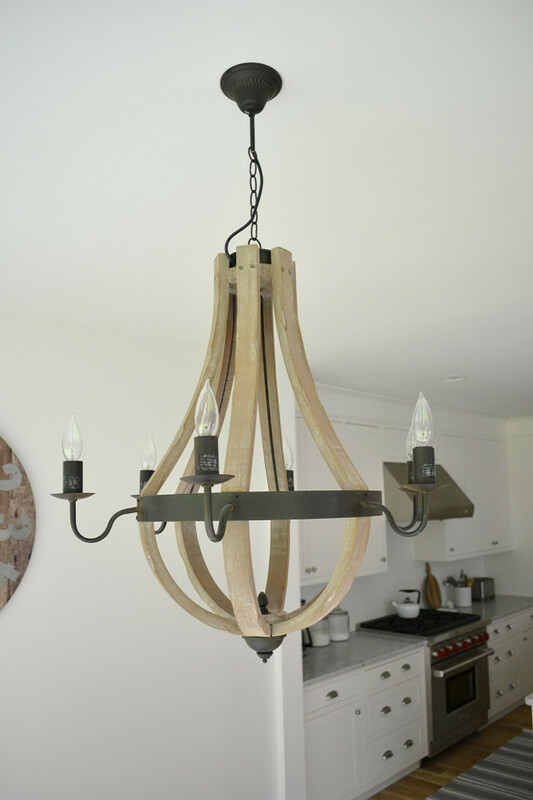 The chandelier was an antique store find and the desk was my grandmother’s that we painted white. 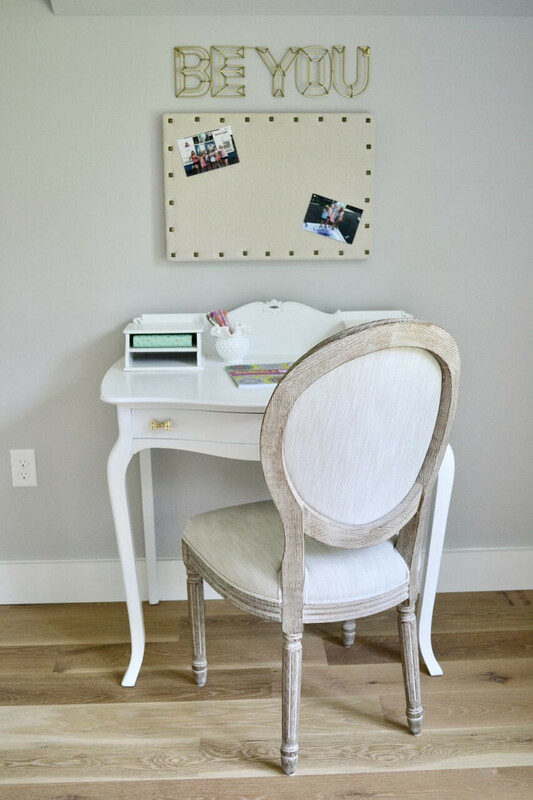 It certainly has a vintage modern feel and is perfect for the tween years we have ahead. Lastly, our family hang out spot when the weather is nice and warm is our newly built back porch. I don’t know how we lived without this space the first year we moved in but it’s a place you will find us most afternoons and evenings. We love to turn on the string lights at night and sit and listen to music. It’s a nice, cozy nook in our backyard. I hope you have enjoyed a tour of our home! For our latest projects, DIYs and more follow me on Instagram! @Finding__Lovely: Beautiful Homes of Instagram. I’d keep that man around if I was her! A handy man is hard to find. lol I hope your week is off to a good start. Thank you for these inspirational photos! 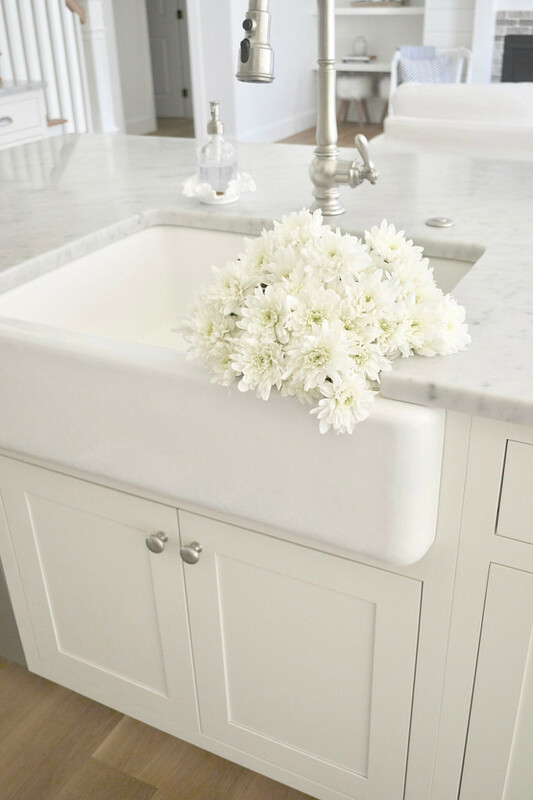 I’m about to pick a paint color for my kitchen and have thought about Alabaster! It seems so much more ‘yellowy’ in the paint swatches- is it really this white in person? Any feedback is appreciated!!!! It’s amazing beautiful!!! The floor u used for ur living room n guest bathroom, what material is it? Where did you buy it from?